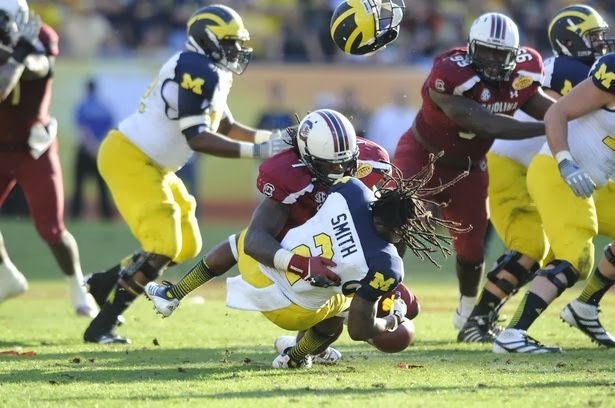 Jadeveon Clowney, the South Carolina Gamecocks Student and Defensive End, reached the top of the charts of many NFL Draft watchers after his amazing performance in 2013, and one that was punctuated by this still-shocking play against Michigan in the Outback Bowl shown in the photo. But the 2013 season has been a disappointing one for those who believed Jadeveon Clowney was going to destroy the SEC. A series of nagging injuries combined with the large degree of attention placed on him, have combined to wreck his NFL Draft prospects, at least right now.